Details: ABOISTOP ANTI-BARK COLLAR STOPS DOGS BARKING No electric shocks - stops dogs barking with a harmless spray Brings peace to the neighbourhood,The quiet revolution through science Kits contain Aboistop unit, collar, battery and odourless refill. Refills and batteries available. ABOISTOP ANTI-BARK COLLAR Nothing is more likely to lose you friends than your dog shouting his opinions from the rooftops. The Aboistop is triggered automatically by the dog's bark and emits a spray of citronella fragrance under the dog's chin. The surprise of the spray immediately distracts the dog and so the barking stops, along with any associated behaviours. Dogs will resume their barking on removal of the collar. The Aboistop is highly effective and humane - the answer to prayers for a quieter world! 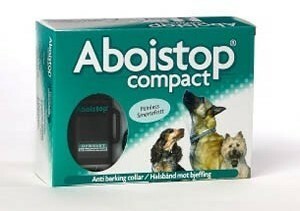 Aboistop suitable for all breeds larger than Cocker Spaniel, New Generation Aboistop suitable for breeds smaller than Cocker Spaniel.